Unearth some of the gems of Easter Island´s fascinating past with stops at several significant sites of interest. Head to Puna Pau, the small crater that acted as the scoria quarry for the moai's famous topknots, before continuing to the site of the island´s most intricate stone work at Ahu Tahira in Vinapu, where the moai platform is reminiscient of the legendary masonry of the Incas of South America. Take in the breathtaking views at the giant cauldron of Rano Kau, a miniature eco-system and the largest volcano crater on the island. Experience the wind on your face at the clifftop ceremonial village of Orongo, and discover the significance of the Birdman Cult that emerged out of the ruins of the Moai building era. Peer off the precipice at the ocean below where once a year during the Birdman competition, brave warriors from the island's various clans would climb down the steep rocky cliffs to the swirling ocean below and swim out to the small islets off the coast in an attempt to bring back the first egg of the manutara bird, therefore winning the right for their clan to rule the island for the following year. Finish the day with a visit to Ahu Akivi, the renowned seven inland moai that stand gazing oceanwards, and explore the large and unique cave system of Ana Te Pahu, known affectionately as "The Banana Cave". This excursion can be done as a private tour or as a small group tour. The Historic Pathways small group tour runs on Mondays, Wednesdays and Fridays for between one and eight people. The maximum amount of languages spoken on the tour will be two (usually English or Spanish). Pick up from your lodgings is between 9:30AM-10:00AM. Lunch is not included in the tour, but there is an opportunity to have lunch at a small restaurant in Hanga Roa halfway through the day. Puna Pau - As if it wasn’t enough to make huge monolithic statues, in the latter years, large scoria topknots were made and fitted on the heads of the moai. Puna Pau is the small crater where these adornments were made. Vinapu - The site of some of the island's most beautiful stonework, reminiscent of the legendary masonary found in the great Inca civilization of South America. Ana Kai Tangata – A seaside cave with paintings on the roof, and a name that reflects the cannibalism which took place on the island during the warfare period. Orongo – The ceremonial village, where during the 18th and 19th centuries, one of the most interesting political ceremonies happened once a year as different tribes competed to become the leader of the island. In a breathtaking sports event that involved climbing down cliffs, swimming out to the islets off the coast, the islanders came to this beautiful part of the island to see who would be their next ruler. Ana te Pahu - Like many volcanic islands, Easter Island is riddled with lava tubes. 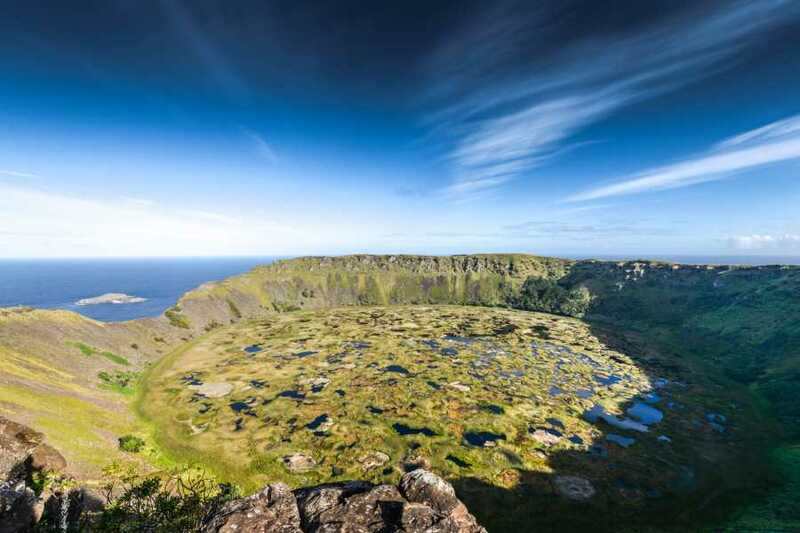 Ana Te Pahu is one of the more extensive networks found on the island and shows how the ancient Rapanui people used these cave networks to live, collect water, plant vegetables and hide from aggressive visitors from outside in the 18th and 19th centuries. Duration - Approximately seven hours.